You guys should know by know just how much I love pizza. Pizza is like my family. Pizza is my one true love. So when a friend of mine was visiting from Providence, what better place to go grab lunch than a cool, kitchsy, wood-fired pizza place? 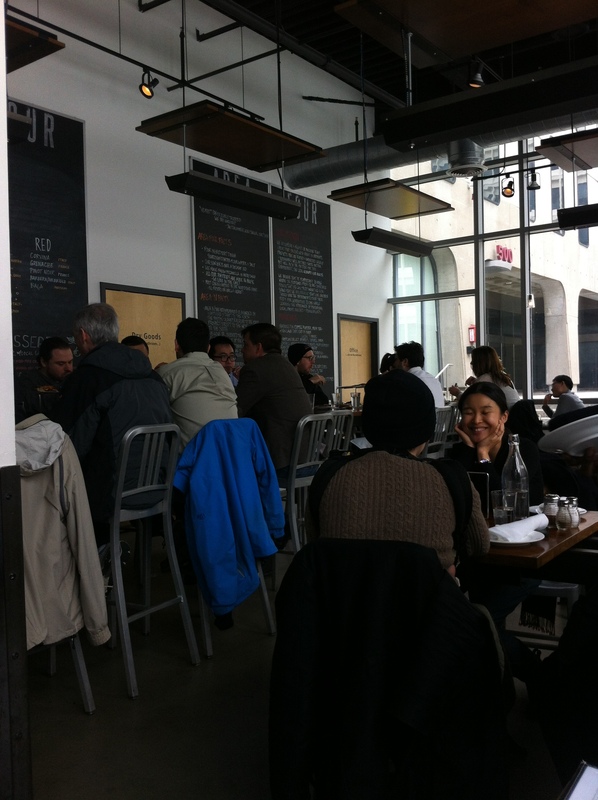 We ended up going to a place called Area Four over in Kendall Square (500 Technology Square, Cambridge MA 02139) which is within walking distance from my bakery! 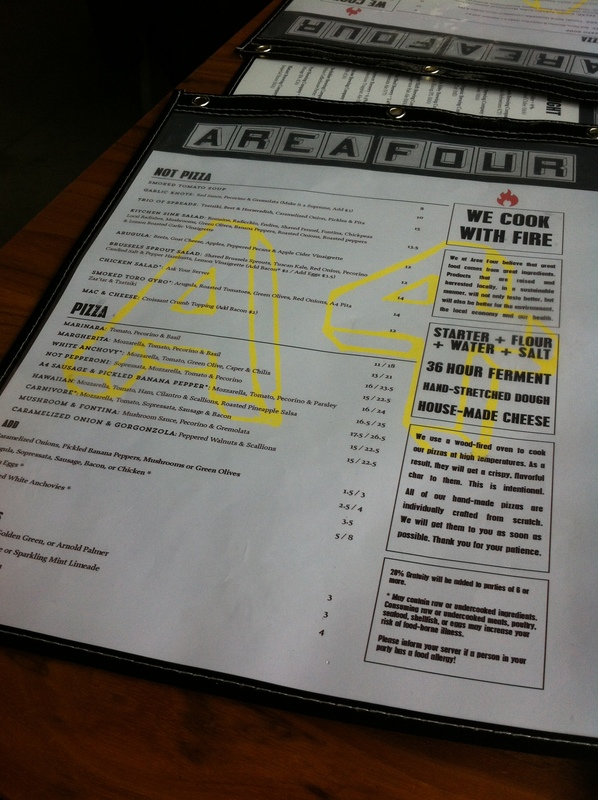 I had heard so many great things about Area Four so I figured it was the perfect place. All of the pizzas at Area Four are made with a 12 year old dough starter and ferments for 30 hours before being topped with handcrafted cheese and baked in a wood-fire oven. *Insert drooling mouth image here* Being that Area Four is also a cafe, they offer a bunch of morning options like sandwiches, yogurts, oatmeals, soups and salads and a pretty diverse list of coffees, teas, espressos, etc. But of course, the main attraction is their pizza. 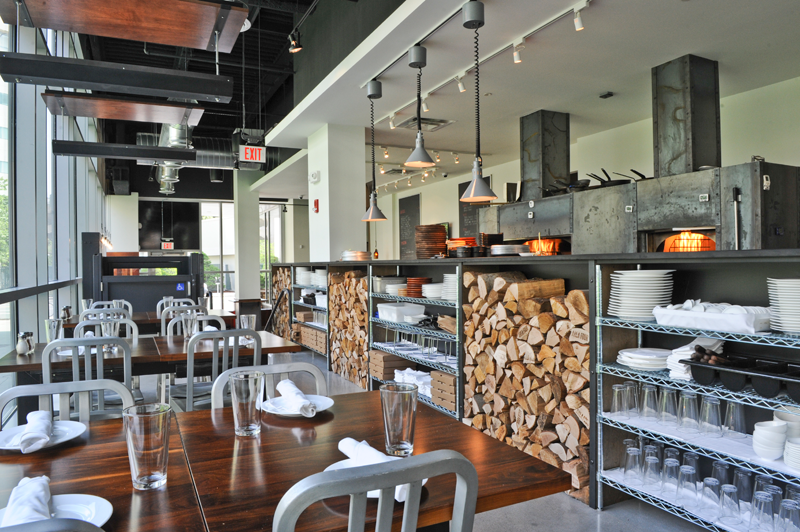 Area Four was featured on Food Network’s Best Ever show and has been named one of Boston’s 50 Best Restaurants. They have two locations (one in Kendall Square and another in Union Square) and then even have a roaming food truck. Okok let’s get down to business and discuss their menu! They have a couple appetizer-y things but they split the menu up into sections: Not Pizza and Pizza. Pretty self-explanatory. You can order any extra toppings on the pizzas at an extra cost which pretty much enables you to customize it to your own taste. 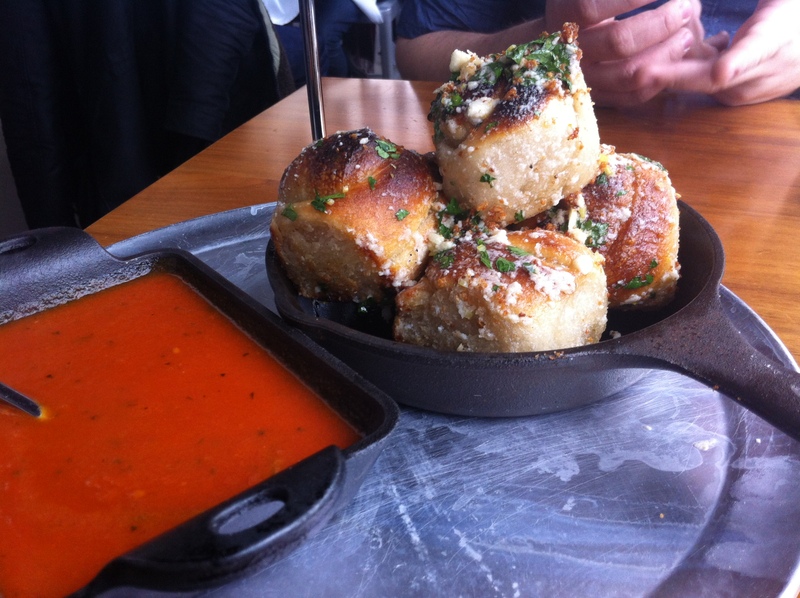 My friend and I first ordered the garlic knots to share. They came out on a small sizzle plate which made the bottom of the knots crusty but they still remained soft in the middle. They were lightly covered in oil with pecorino and gremolata cheeses with marinara sauce on the side. They were the perfect appetizer before the pizza. YAY CARBS! The pizza came in two sizes, 10″ or 14″, and being that my friend and I were splitting, we weren’t sure exactly how hungry we were. Cause you know, who can’t eat a whole pizza by themselves anyway? But our waiter said the appetizer was on the heavy side so we got the 10″ pizza to split. It was good advice in the end! 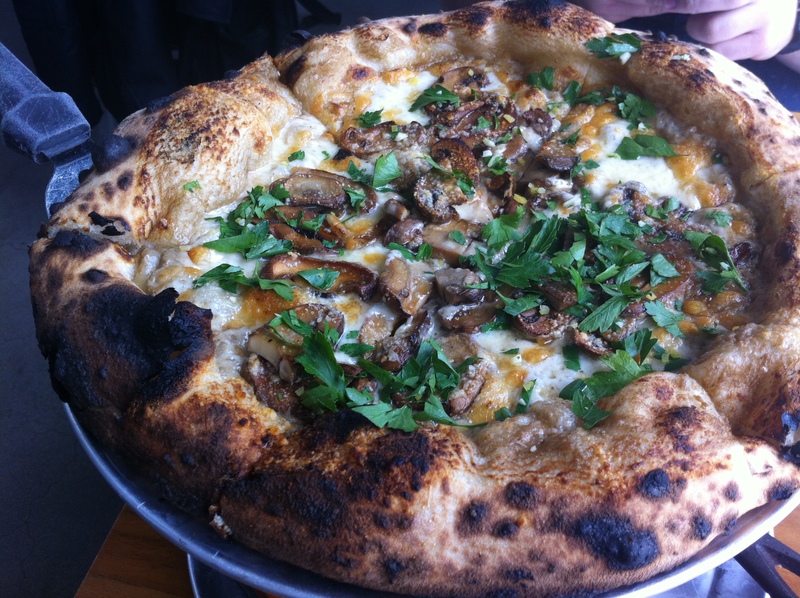 We went for the Mushroom and Fontina pizza, no additions and it was SO. GOOD. And I’m not even a big fan of mushrooms! I was also eye-ing up their carnivore pizza which has mozzarella, tomato, sopressata, sausage and bacon OR their caramelized onion and gorgonzola pizza with peppered walnuts and scallions. I guess I’ll just have to go back another time! In the end, Frank and I paid about 15 bucks a person including tip for the 6-slice pizza and an appetizer. I left feeling full but not stuffed to the brim which is always how I like to feel after a meal- satisfied. I’m DEFINITELY going to go back here again; what a great place to grab lunch! Staff was friendly and knowledgeable and the atmosphere was welcoming. They also really seem to care about their purveyors and ingredients and as a food service person, this is something that I take to heart. I’ll be back, A4! Thanks for lunch! See you next week, friends!